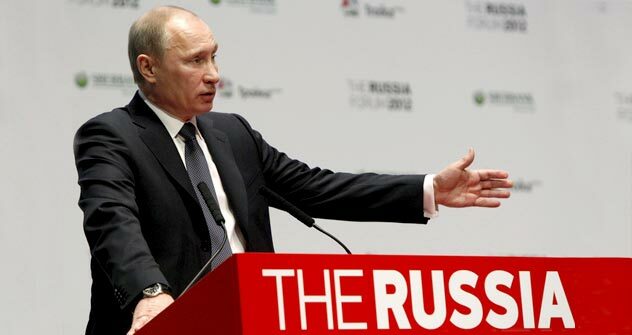 Speaking at the The Russia Forum 2012, Vladimir Putin promised that Russia would rise from 120th to 20thplace in the World Bank and International Financial Corporation country ratings in terms of doing business. One way the prime minister hopes to achieve this is by introducing the office of ombudsman. “In order to see further, you have to sit higher,” said presidential candidate and Prime Minister Vladimir Putin, as he began his remarks to The Russia Forum, an annual event in Moscow sponsored by investment bank Troika Dialog. “Russia is among the top five countries in terms of potential for attracting foreign investments, but it is in a shameful 120th place in terms of investment climate,” Putin said, discussing the country’s rankings in World Bank and International Financial Corporation indicators. The prime minister then went on to set an ambitious goal for the country – to rise 100 places in the ranking to 20th. It is a leap that will require Russia to raise production efficiency, which in turn requires greater protection of entrepreneurs. To oversee and encourage this process, Putin has proposed creating the special position of ombudsman for business. The Russian government introduced the first financial ombudsman in 2010 to settle disputes between Russian citizens and financial entities. The new business ombudsman will have much wider powers. His main responsibility will be to fight for the interests of entrepreneurs in court, to deal with their complaints, and introduce proposals to government bodies. He will have the right to suspend departmental regulatory acts pending a court ruling and to go to court to stop the actions of power institutions. In short, the ombudsman will protect entrepreneurs against the bureaucrats. Both businessmen and economists welcome the idea of an ombudsman because they think the country needs someone to protect the rights of entrepreneurs. Yet both have doubts as to whether a single person can make a real difference to the system. “Of course such a person is needed,” said Vadim Dymov, owner of a network of meatpacking plants. “I am absolutely convinced that, in a country where the share of small and medium–sized businesses is very low compared to other countries, everyone, above all law enforcement bodies, should protect the rights and interests of entrepreneurs.” Dymov added that in his opinion, the state has enough tools for protecting entrepreneurs, but they are not effective enough. Dmitry Butrin, a journalist for business daily Kommersant believes that a change in court practice might improve the business environment, but that the creation of the post of ombudsman should be seen as a useful, but temporary measure. “When you can’t walk on your own feet, you temporarily use a walking stick to support you. But you don’t say that with a walking stick, you don’t need to take care of your feet,” Butrin said. The prime minister did not say how soon these proposals would be put into practice.